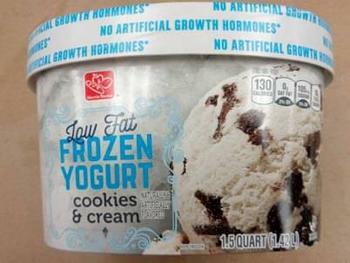 Harris Teeter is recalling Harris Teeter Low Fat Frozen Yogurt Cookies & Cream. The product contains peanut butter, an allergen not declared on the label. The product, which comes in a 1.5-quart laminated carton, with UPC 0 72036 98182 0, and all SELL BY DATES up to 07/30/19 was distributed to Harris Teeter stores located in Washington, D.C., Delaware, Florida, Georgia, Maryland, North Carolina, South Carolina and Virginia from June 6 thru September 23, 2018. The company will use loyalty card data to notify shoppers of the recall via voicemail and email. Customers who purchased the recalled product and have an allergy or severe sensitivity to peanuts should not consume it, and may return it to Harris Teeter for a full refund. Consumers with questions may contact Harris Teeter’s customer relations department at (800) 432-6111, and select option 2 Monday – Friday, 8:30 am – 6pm (EST).